Search For "Pharmaceuticals" Companies in Agoura Hills, California - Click Here Now! 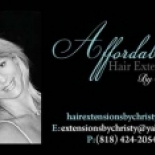 Affordable Hair Extensions By Christy - Hair Extenion Stylist (818) 424-2054 in Agoura Hills is a company that specializes in Medicinals & Botanicals. Our records show it was established in California.